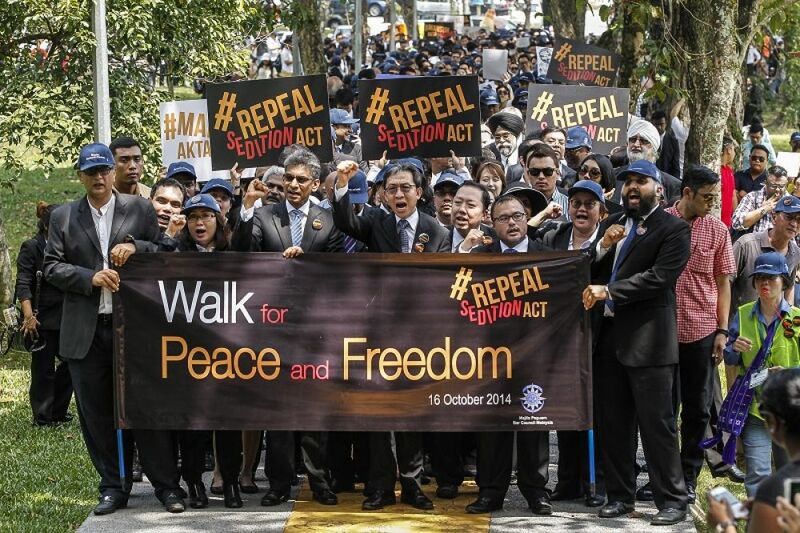 Lawyers participating in a peaceful rally, calling for the Sedition Act to be repealed, in Kuala Lumpur in 2014. The law was used in the same year against, among others, a student activist, and another seven people, including a journalist, were being investigated under the act. – EPA pic, February 22, 2018. 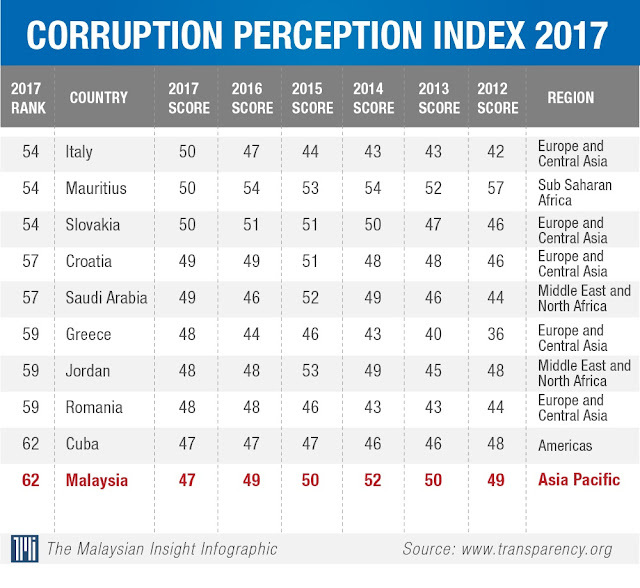 KUALA LUMPUR: The recent conviction of a whistleblower and the absence of political financing laws are among the reasons that affected Malaysia's global anti-corruption scores, Transparency InternationaI Malaysia (TI-M) president Datuk Akhbar Satar said when presenting the 2017 Corruption Perception Index (CPI) today. Malaysia ranked 62 among 180 countries in the CPI last year, dropping from 55th spot in 2016. The index put Malaysia in the same spot as Cuba, with a score of 47 out of 100. 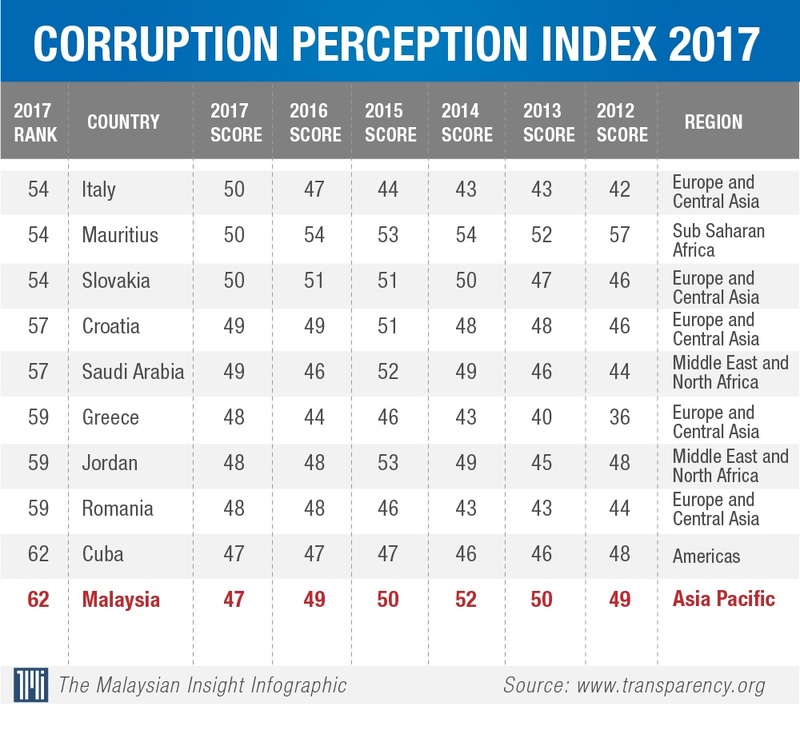 In 2016, Malaysia ranked 55 with a score of 49. 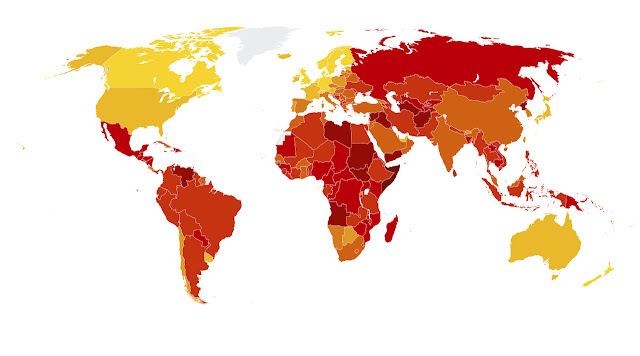 The CPI is a global aggregate index capturing corruption perception in the public sector worldwide based on expert opinions using a scale of 0-100, with a smaller score denomination denoting a higher level of corruption. "This is the worst score in the last five years and the lowest ranking since CPI was introduced in 1994." Akhbar said contributing factors to such poor perception of Malaysia include unresolved cases involving 1Malaysia Development Berhad (1MDB), absence of political financing laws and corporate liability provisions in anti-graft laws. "The reason is simple ... the 1MDB and SRC International Sdn Bhd issues, Felda Global Ventures Holdings Bhd scandal and also the conviction of PKR vice-president Rafizi Ramli for whistleblowing." Akhbar stressed that Malaysia has to relook into its whistleblowing laws to ensure there is proper protection for those who expose corrupt activities. "It is very sad that whistleblowers get arrested and punished here when most other countries have tried to enact whistleblowing laws to protect them. "Here, we are at the opposites. If you don't comply with the whistleblowing policy and use the media to expose corruption, then you are not protected. The top five countries in the 2017 index were New Zealand (89) and Denmark (88), followed by Finland, Norway and Switzerland (85). 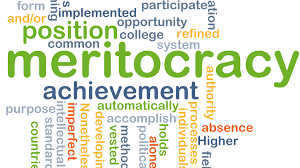 The index also revealed that more than two-thirds of countries worldwide scored below 50, with an average score of 43. Countries at the bottom of the index were Yemen, Sudan, Afghanistan, Syria, South Sudan and Somalia. Meanwhile, MACC honorary commissioner and former TI-M president Tan Sri Ramon Navaratnam expressed disappointment on Malaysia's score. "All the good work done by MACC to robustly fight corruption has been negated by the apparent inability to do more to contain 'grand corruption', which matters in the view of TI," he said. The index, which ranks 180 countries and territories by their perceived levels of public sector corruption according to experts and businesspeople, uses a scale of 0 to 100, where 0 is highly corrupt and 100 is very clean. This year, the index found that more than two-thirds of countries score below 50, with an average score of 43. Unfortunately, compared to recent years, this poor performance is nothing new. This year, New Zealand and Denmark rank highest with scores of 89 and 88 respectively. Syria, South Sudan and Somalia rank lowest with scores of 14, 12 and 9 respectively. The best performing region is Western Europe with an average score of 66. The worst performing regions are Sub-Saharan Africa (average score 32) and Eastern Europe and Central Asia (average score 34). Since 2012, several countries significantly improved their index score, including Côte d’Ivoire, Senegal and the United Kingdom, while several countries declined, including Syria, Yemen and Australia. Further analysis of the results indicates that countries with the least protection for press and non-governmental organisations (NGOs) also tend to have the worst rates of corruption. Every week at least one journalist is killed in a country that is highly corrupt. The analysis, which incorporates data from the Committee to Protect Journalists, shows that in the last six years, more than 9 out of 10 journalists were killed in countries that score 45 or less on the index. No activist or reporter should have to fear for their lives when speaking out against corruption. Given current crackdowns on both civil society and the media worldwide, we need to do more to protect those who speak up. CPI results correlate not only with the attacks on press freedom and the reduction of space for civil society organisations. In fact, what is at stake is the very essence of democracy and freedom. Governments and businesses must do more to encourage free speech, independent media, political dissent and an open and engaged civil society. Governments should minimise regulations on media, including traditional and new media, and ensure that journalists can work without fear of repression or violence. In addition, international donors should consider press freedom relevant to development aid or access to international organisations. Civil society and governments should promote laws that focus on access to information. This access helps enhance transparency and accountability while reducing opportunities for corruption. It is important, however, for governments to not only invest in an appropriate legal framework for such laws, but also commit to their implementation. Activists and governments should take advantage of the momentum generated by the United Nations Sustainable Development Goals (SDGs) to advocate and push for reforms at the national and global level. Specifically, governments must ensure access to information and the protection of fundamental freedoms and align these to international agreements and best practices. Governments and businesses should proactively disclose relevant public interest information in open data formats. Proactive disclosure of relevant data, including government budgets, company ownership, public procurement and political party finances allows journalists, civil society and affected communities to identify patterns of corrupt conduct more efficiently.